Loaded Po'taters at Weinerschnitzel! - San Diego Dining Dish! For a limited time, Wienerschnitzel is offering a brand new menu item, Loaded Po'taters! Building upon the wild popularity of the Loaded Chili Cheese Fries that debuted last year, these Loaded Po’Taters are a step up! 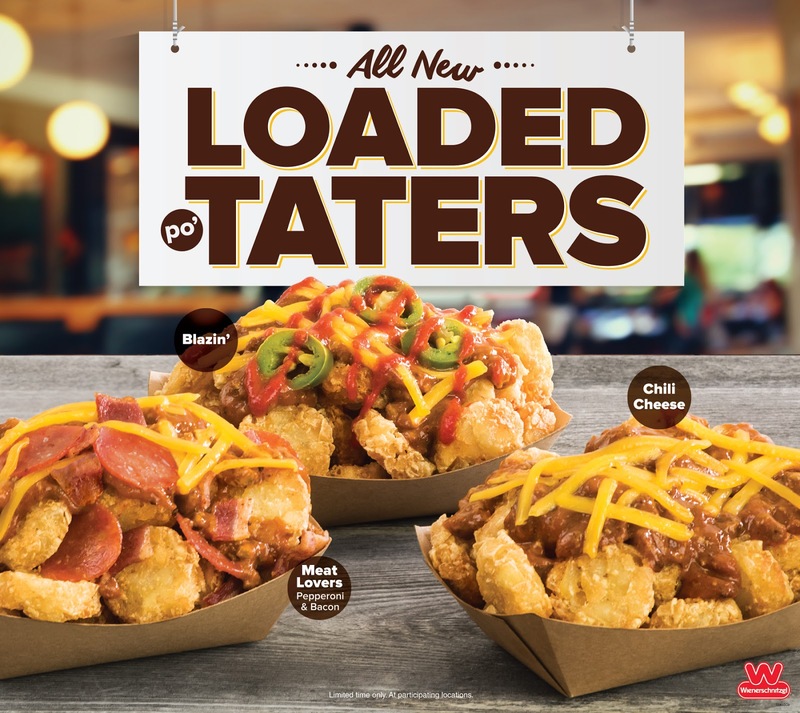 Each heaping portion of crispy taters are smothered in Wienerschnitzel’s world famous chili and shredded cheese, and then loaded with awesome toppings like bacon, pepperoni, jalapeños and their new red jalapeno and garlic Blazin’ Sauce. Want to try 'em? I'm hosting a giveaway for 3 (yes three!) $10 gift cards good for Weinerschnitzel! Just leave a comment on this entry to enter! The winner will be chosen on April 25! Good luck! The Weinerschnitzel makes me so nostalgic. When we were little back in the late 60's my Grandparents would load us in the back of the station wagon and we would drive through the Weinerschnitzel and get mustard dogs and kraut dogs. I still love em and think of my wonderful grandparents every time we visit. Oh my goodness! The chili cheese fries are delicious. The idea of that on tater tots instead sounds amazing! I grew up around the corner from Weinerschnitzel. I used to count my change and order a hot dog. Tater tot fries sound great and I'm ready to try them. Thanks for the chance at a gift card.